As always when I am in the car, while Daisy and I drove to my folks’ house in Saugerties, NY, to join family for the Christmas holiday, I paid careful attention to any and all bird life I could see. I did not, however, expect to have yet another encounter with what is now by far my favorite winter finch, Pine Grosbeaks. I don’t know if regular readers of this blog are sick of hearing about and seeing pictures of them yet or not: frankly, my dear reader, I don’t give a hoot. 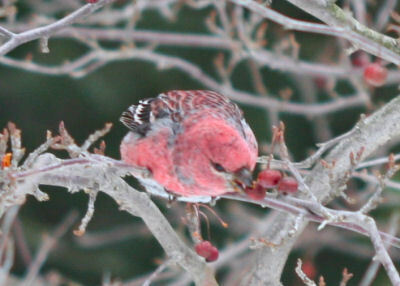 I love Pine Grosbeaks! And other than spending time with loved ones I can’t think of a better Christmas present than Pine Grosbeaks hanging out within a one-minute walk of my parents’ house. So of course, once Daisy and I arrived I excitedly told my parents what we had seen and we walked up the street to see the birds. My father was a bit upset that they chose the crabapples over his feeders (but the bird seed, suet, and new finch feeder he got under the tree mollified him somewhat). 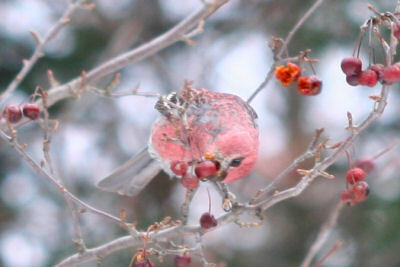 We all enjoyed the flock of fourteen winter finches, all but one of them female-types, but that one was a gorgeous male. Talk about a Merry Christmas! I hope your holiday was as bird-filled as mine! 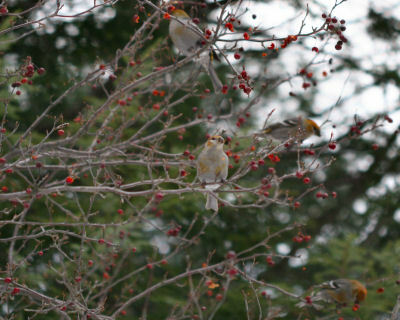 What Corey didn’t mention is these were the first pine grosbeaks after 60 years of watching birds somewhat. Hi Corey, I love this website and have been reading it for several months now. 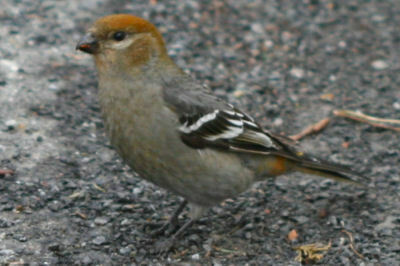 I happen to live in Kingston, NY and have never seen a Pine Grosbeak. If it is possible could you please let me know where in Saugerties you saw the birds. I would really appreciate the help. My email address is tjg123tds AT hotmail.com. I am not sick of reading about them but I hope at some point this year to do my own post on seeing them! Congrats and a wonderful Christmas Present! @Travis: The info is in your email inbox. @monarch: Hope they finally make their way into your field of view. That’s great! I just saw my first Pine Grosbeaks today.-Right here in Connecticut! sigh! We really need to see one (or a bunch!) of those neat guys. What a neat bird to watch, glad you got to see them this year. I think first we would have to see a Pine Grosbeak and then decide whether to get sick of them or not…I’m thinking not!